After performing 'Can't Help Thinking About Me', 'I Dig Everything' and 'The London Boys' on the short tours of 1999/2000, Bowie became enthusiastic about the idea of re-recording some lesser known songs from the early days of his career. These re-recordings, together with a couple of new songs, were to appear on an album titled Toy, that was tentatively scheduled for mid-2001. 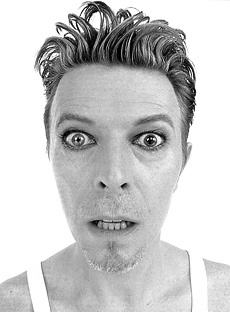 According to David's journal on BowieNet, the production and artwork of the album were finished already by early 2001. However, time passed and rumours filtered through that Virgin appeared to be reluctant to release an album full of songs they didn't have the rights to. At the end of 2001, Bowie left Virgin to set up his own record label ISO, but the complete Toy album thus far remains unreleased. Uncle Floyd/Afraid/Baby Loves That Way/I Dig Everything/Conversation Piece/Let Me Sleep Beside You/Toy/Hole In The Ground/Shadow Man/In The Heat of the Morning/You've Got a Habit Of Leaving/Karma Man. In 2006, the complete Toy album was leaked to some fans. Besides the 11 tracks above, also 'The London Boys', 'Liza Jane' and 'Silly Boy Blue' appeared. However, 'Karma Man' is not among the tracks that surfaced, so my assumption is that 'Silly Boy Blue' rather than 'Karma Man' was supposed to have closed Toy. Given the fact that 'Can't Help Thinking About Me' was among the songs played live, it seems likely that this song too was recorded but later rejected. In 2011, the album was torrented, making it available to all Bowie fans. Below is a complete run-down of the entire Toy album, plus the "bonus tracks". The leaked album is an early and not yet finished version, as is testified by the fact that the officially released tracks often differ subtly. Uncle Floyd (6'14"): a new song written for Toy and later re-recorded for Heathen as 'Slip Away'. The Toy version opens with a lengthy excerpt of almost a minute from the Uncle Floyd Show, similar to the live version performed on the Reality tour. The production of 'Uncle Floyd' is less rich than 'Slip Away', for which David also re-recorded his vocal. There are minor lyrical differences (e.g. 'Once a time they nearly might have been Bones and Oogie on a moving screen'). The first 'Don't forget to keep your head warm' chorus in 'Slip Away' also is absent in Toy's 'Uncle Floyd'. All in all, 'Uncle Floyd' does not sound as mature and majestic as 'Slip Away', but it is by no means less melancholic. Afraid (3'28"): another new song recorded for Toy which later appeared on Heathen. The original Toy version of this song has a slightly different instrumentation and additional backing vocals. However, David's original vocal has been maintained on the Heathen version. Essentially, the Heathen version is a remix, not a re-recording. Most obviously, it lacks the Tony Visconti string arrangement. Baby Loves That Way (4'37"): this re-recording has been officially released on the Japanese 'Slow Burn' single (Sony SICP-162) and in the UK and EC on the 'Everyone Says 'Hi' CD single (ISO/Columbia 673134 5 and ISO/Columbia COL 673076 2). The Toy the version is slightly different because it features a more prominent drum beat (including a simple beat instead of a drum roll in the intro) and has some studio banter (e.g. at 3'52" into the song) that has been removed from the released version. The latter is a couple of seconds longer (4'45") than the Toy version. I Dig Everything (4'52"): this song remains unreleased. Like 'Baby Loves That Way' and many other tracks on Toy, 'I Dig Everything' was re-recorded a slower pace compared to the original. In this case, it has been reworked into a rather straightforward rock song, lacking the 60s feel of the original. The chorus prominently features backing vocalists Emm Gryner and Holy Palmer: 'Every/Everything/Every/Dig everything'. Conversation Piece (3'52"): this Toy track probably is best known, because it appeared on the bonus disc of the 2CD edition of Heathen. The atmosphere of the re-recording is quite close to the 1970 original, but the production is much richer. Let Me Sleep Beside You (3'14"): this re-recording for Toy is a fantastic, rather guitar-heavy re-recording with breathy vocals by Bowie. Unfortunately, it remains unreleased. Toy (4'46"): the third new song for Toy. It was offered as a free download (re-titled 'Your Turn To Drive') to customers who ordered their copy of Reality online from HMV. Later it was made available as an 'exclusive track' in the iTunes Music Store. The title 'Toy' remains a mystery to me! Hole In The Ground (3'33"): this song was demoed in (probably) 1970 by David, George Underwood, Herbie Flowers, Tim Renwick and Terry Cox. Musically, the Toy re-recording bears some resemblance to the 'do-do-do' part of 'Walk On The Wild Side'. The lyrics are not among Bowie's most interesting: 'There's a hole in my ground/But there's no one around/With my shoes on the street/And I'm quick on my feet/And I'm running to you/Just a-looking above me'. Shadow Man (4'40"): this delicate re-recording of a 1971 demo is the highlight of the Toy album. A slightly longer version (4'48"), with an additional string section, was officially released on both EC editions of the 'Slow Burn' CD-single (ISO/Columbia COL 672744 1 and COL 672744 2) and on the UK 'Everyone Says 'Hi'' single (ISO/Columbia 673134 3). Its use as a B-side certainly does not do it justice. In The Heat of the Morning (3'50"): this track remains unreleased. Tony Visconti added his trademark string arrangement to the original from 1968. The Toy re-recording is quite close to the original, albeit slightly slower, but lacks the strings! You've Got a Habit Of Leaving (4'49"): the Toy version featured on the EC 'Slow Burn' (ISO/Columbia COL 672744 2) and UK 'Everyone Says 'Hi' singles (ISO/Columbia 673134 5). The vocals of the Toy version are mixed more prominently in the foreground compared to the released version and the "megaphone-effect" on the line 'You could grow up if you wanted to' is absent. Also Bowie announces Earl Slick's guitar part at 3'49". There are also minor differences in instrumentation, e.g. the the kickdrum announcing the lengthy instrumental coda at 3'38" into the released version is absent in the Toy version. Silly Boy Blue (5'33"): this track remains unreleased. It is a first-rate, stately re-recording which resembles the version recorded in 1968 for the BBC (available on Bowie At The Beeb), including the "Chimi Chimi Chimi" part. The string arrangement is particularly beautiful. The long coda suggests this song might have closed the album. Liza Jane (4'47"): it's very hard to identify with the original 1964 version in this recording. The original arrangement has been reworked into what one might call 'swing jazz'! Except for the chorus, Bowie's vocals have been treated and are buried rather deep in the mix. London Boys, The (3'46"): although this re-recording sounds much more modern than the 1965 version, it is quite faithful to the original. In July 2002, a 1'26" excerpt of this Toy version was issued as a "secret B-side" on a section of BowieNet dedicated to the Heathen album. In August, another 1'30" excerpt appeared. However, both these teasers still did not cover the entire song. The officially released version is more up-tempo and probably a different recording altogether. Although individuals songs have been made available as single B-sides or as re-recordings on Heathen, some highlights, such as 'Let Me Sleep Beside You' and 'Silly Boy Blue', unfortunately remain unreleased. When listening to Toy as a body of work, it is decidedly more than the sum of its parts. The songs sound fresh and powerful and, in most cases, early-career songs are an improvement on the original recordings. It is beyond me why this album has not been released yet!